New York city’s zoning laws have created a unique set of circumstances where developers attempt to maximise their property’s height in order to infuse it with the prestige of a high rise structure. "But what if we substituted height with length?" reads a statement on design studio Oiio's website. "What if our buildings were long instead of tall? "It's no secret that there is a serious space issue in Manhattan. Architects build upward because there is no room to build out. "If we manage to bend our structure instead of bending the zoning rules of New York we would be able to create one of the most prestigious buildings in Manhattan... 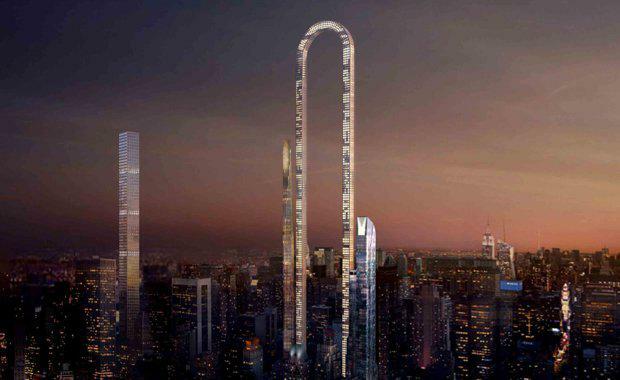 The longest building in the world," reads the proposal on Oiio's website. 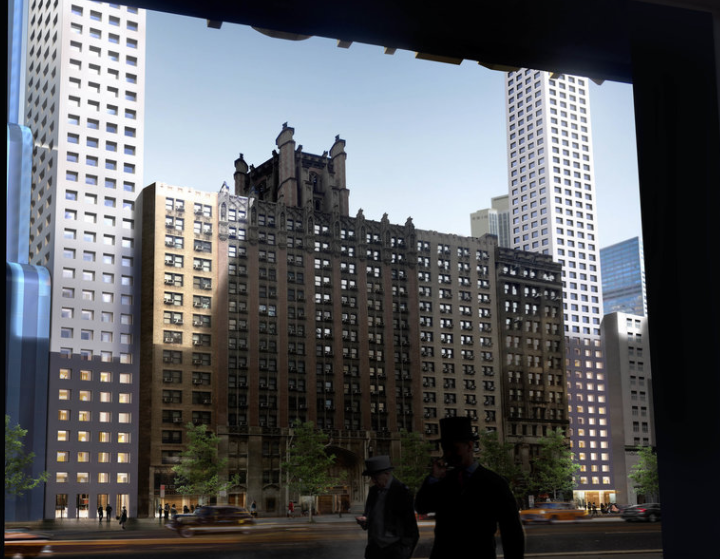 Cue: 'The Big Bend' by Greek architect Ioannis Oikonomou's studio, which can become a modest architectural solution to the height limitations of Manhattan, proposed for 57th Street. "We can now provide our structures with the measurements that will make them stand out without worrying about the limits of the sky," said a statement by Oiio. Oiio told Business Insider that the firm is currently seeking investments for the building design. 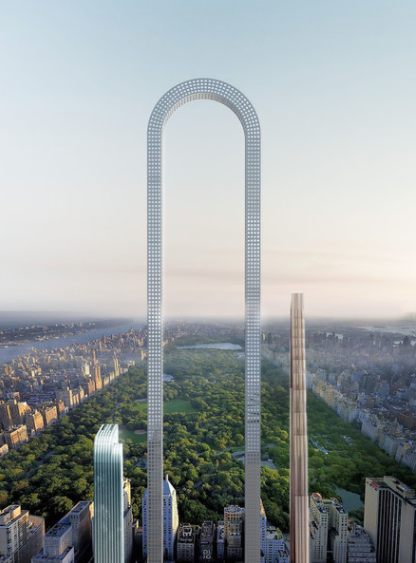 The tall, skinny tower would bend in half and will measure to be about 200 feet taller than One World Trade Center, which is currently the city's tallest skyscraper. The towers' total height would measure 4,000 feet from one end to the other — making it nearly double that of the world's tallest building, the Burj Khalifa in Dubai. Imagine the view looking downward... Source: OiioThe residential building would be located on "Billionaire's Row," which runs along the southern border of Central Park and is already home to numerous other luxury high rises. He said he thinks developers will like the plan because it doesn't take up too much space, and will cater to homeowners' desire to have multiple residences. Real estate companies are capitalising on a planning law that permits them to purchase air rights from neighbouring buildings, allowing for taller and taller towers on relatively small plots, highlighting the desirability for designs like The Big Bend. What was once considered to be the greatest challenge in elevator history is finally becoming a reality: An elevator that can travel in curves, horizontally and in continuous loops. The innovative track changing system allows for the horizontal connection of the two shafts on the top and bottom to create a continuous loop. Thyssen Krupp's MULTI harnesses the power of linear motor technology to move multiple cars in a single shaft both vertically and horizontally. MULTI’s innovative exchange system allows the linear drive and guiding equipment to make 90° turns. How? By leveraging the linear motor technology developed for the magnetic levitation Transrapid train. With MULTI, multiple cabins travel safely up one shaft and down another in a single continuous loop, much like a circular train system on a vertical plane. The only visible difference to passengers – and it’s a welcome one – is that the doors open every 15 to 30 seconds, despite having fewer shafts compared to standard elevator systems. "Buildings are becoming like vertical cities, and they need a flexible transport system, similar to a metro. 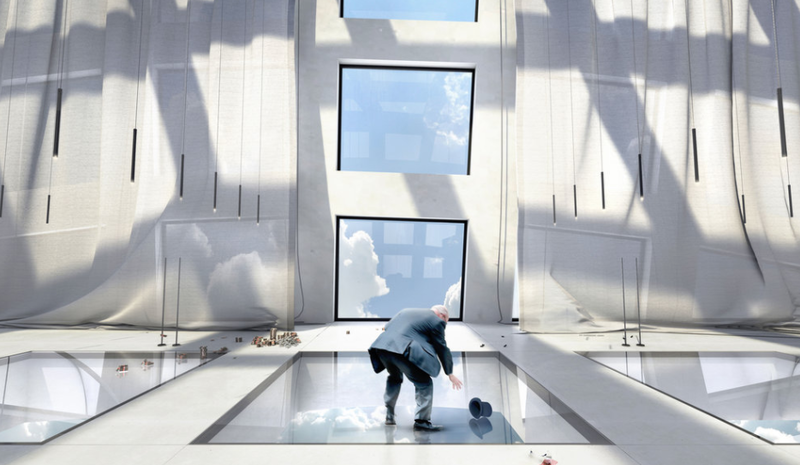 Speed alone does not solve the challenges posed by tall buildings," said thyssenkrupp Elevators' Head of Research, Markus Jetter. New York's Department of City Planning released a statement on the concerns of 'supertall' buildings which included issues around shadowing of Central Park. The letter also stated that Midtown Manhattan had always been a high density/high bulk area given its concentration of mass transit and its role as the city's premier business district. "'Super tall' buildings have the effect of preserving existing height on neighbouring sites, which means that buildings with different heights from different eras (even if not of land mark quality) are less likely to be demolished. "This leads to a more interesting streetscape and pedestrian experience, as well as resulting in a more dynamic iconic, skyline that is the envy of the world," the letter read. "The trade offs between slender buildings which cast a shadow deeper into the park in certain periods of the year, but for a very short time, as opposed to a wall of somewhat less tall buildings, like the wall of the apartment-hotel buildings along Central Park south that cover a segment of the southern portion of the park for much of the day throughout the year is a complex balancing of impacts that we have to monitor," said the letter.